The Coolpix P530 is Nikon’s latest super-zoom bridge camera addition to its Performance range of feature-packed Coolpix cameras. Replacing the Coolpix P520, the new camera boasts a 16.1MP high-sensitivity CMOS sensor with a sensitivity range of ISO 100-6400 and Full HD 1080p video recording. Up front is a whopping 42x optical zoom lens giving an extremely versatile focal length range of 24-1000mm in 35mm camera terms. Lens-shift Vibration Reduction should help keep shots sharp and you’ll be able to compose photos on a crisp 3.0”, 921k-dot monitor or through the electronic viewfinder. The P530 is focussed at the keen photographer and gets a DSLR-like mode dial to easily select dedicated aperture and shutter priority modes, as well as a full manual option. Price-wise, expect to pay around £329.99 / $449.95 / €399.00. 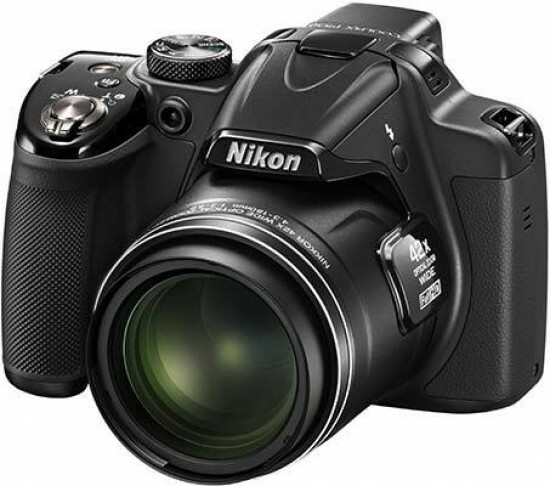 The Nikon Coolpix P530 follows the bridge camera mould, meaning you get the feel and much of the control of a DSLR, combined with plenty of effects modes and compact-camera toys. It’s the best of both worlds for enthusiastic photographers wanting something more serious than a basic point and shoot, plus you get that huge 42x zoom lens to really sweeten the deal. This kind of focal length range is enough to cover pretty much any scenario you’ll ever encounter, and although the same can be said of the P520, the new camera packs this optical punch into a slightly more svelte body that’s approximately 3mm narrower and shallower than before. Weight is also down 56g to 494g, making the P530 surprisingly light for its size. The camera does feel rather plasticky as a result of its crash diet, but the fit and finish is still very good. That chunky design also makes the P530 very comfortable to use and it feels secure in the hand, helped by the rubberised grips at both ends. A rubber rear thumb pad would have been a nice addition, but the embossed plastic alternative still gives your thumb something to grip on to. Although the P530’s bridge camera ethos means you get more manual control than a regular Coolpix camera, this certainly isn’t a daunting device to operate. Up top is the usual shutter release and zoom-ring combo, just ahead of a customisable function button. By default this is set to switch between single or continuous shooting modes, though it can be reprogrammed to control settings like ISO sensitivity or white balance. The power button sits a few millimetres behind the function button, so the two can often be confused when attempting to turn on the camera without looking. It’s great to see a proper mode dial on the P530, as this makes it far easier to switch modes than the menu-based system used on most Coolpix models. It enables you to instantly move between the aperture and shutter priority options, full manual control, programmed auto and fully automatic modes. A separate user-customisable setting means you can store your own shooting mode for quick recall, or you can turn the dial a stage further and reveal the P530’s 9 special effect filters. Check out the image quality section for examples of these. A separate setting accesses the 21 available scene modes, whilst the landscape, night landscape and night portrait presets get their own individual place on the mode dial. If you do fancy getting a bit creative and experimenting with manual photography, the control wheel at the top right of the rear is well placed to alter shutter speed, whilst the multi selector ring dial below cycles up and down the aperture range. This also doubles as a useful way to quickly cycle through menu lists, or you can press it up, down, left or right when shooting to change the flash mode, macro mode, self-timer and exposure compensation. A dedicated video record button is also present, and alongside this is a control to switch between the LCD monitor and electronic viewfinder. It’s a shame Nikon hasn’t fitted the P530 with a sensor to automatically switch between the LCD and EVF when your eye is placed against the camera, and the EVF’s resolution isn’t particularly impressive either. It’s still a welcome feature to have though, especially in bright sunlight when it’s hard to correctly judge exposure via the monitor alone. However, in most lighting conditions you won’t have any trouble seeing the LCD screen as it’s nice and bright and boasts great viewing angles, detail and colour reproduction. Strangely Nikon has ditched the tilting monitor mechanism present on the P520 and fixed the new camera’s screen. This does contribute to the P530’s slimmed-down dimensions and lighter weight, though we suspect it may also be to keep the P530 from snapping at the heels of the pricier P600 in the features stakes. The new monitor has also shrunk from 3.2” on the P520 to 3.0” for the current camera. The P530’s screen isn’t its only downgraded element though. Keen students of Nikon’s Coolpix model line-up may have spotted the new camera’s 16.1 megapixel sensor is down from the 18.1 megapixel device in the P520. That may be a bit of a marketing faux pas, but there are gains to be had from a pixel purge. Both cameras use sensors of the same physical size, hence the P530’s pixels can be slightly larger, making them more light-sensitive and less prone to generating unwanted image noise. Upshot? Theoretically cleaner photos for a marginal drop in image dimensions. Both cameras will record Full HD 1080p video with stereo sound, and the P530 does this to good effect. The results show plenty of detail and although sound quality is less impressive, it’s perfectly adequate for this level of camera. If you’d rather capture a series of stills rather than video, the P530 will record at 7fps, albeit only for a 7-shot burst. Reduce the shooting rate to 1fps and you can capture up to 200 consecutive shots, or drop the image resolution to Full HD 1920x1080 and the camera will chug away at 60fps. Alternatively if you can live with a titchy 640x480 image size, high-speed 120fps shooting is possible. Back to the business of cut features and we find an oddly positioned plastic panel on the left side of the lens, which was once home to the secondary zoom control on the P520. Consequently you can no longer zoom with your left hand and keep your right hand free to adjust settings or snap the shutter. If you’re expecting GPS geotagging and location mapping to make an appearance in the P530 as they did in the P520, then you’re in for another disappointment as GPS has also been cut from the features list. Nikon hasn’t seen fit to pack in proper Wi-Fi connectivity either. It wasn’t present in the P520 either, and despite claims that both cameras do sport Wi-Fi connectivity, you’ll need to shell out around £50/$70 for an optional WU-1a Wi-Fi dongle to achieve it. At least the new camera does extract more life out its 1100MAh rechargeable Li-ion battery. The pretty paltry 200-shot lifespan of the P520 has now been upped to a more useful – if still relatively mediocre – 240 shots. Power up the Coolpix P530 and it’s ready for action in a fraction under one second. Autofocussing is almost instant in most lighting conditions, though when the going gets dim the camera can require a frustrating few seconds to find its mark. The problem is compounded if you shoot in low light at the upper end of the camera’s zoom range, whereby autofocussing occasionally fails altogether. Thankfully such instances are rare. We’ve got no complaints with the P530’s auto white balance though, which didn’t fall foul of some trickier lighting scenarios which have been known to faze similar cameras. Likewise the camera’s exposure metering invariably struck the correct balance of highlight and shadow detail during our testing.